A DSC is a component that can be installed on a Documents Server and introduces new functionality. It stands for Document Service Component. Most product components are DSCs but customers can write their own DSCs to create new integrations or functionality that require a higher level of sophistication than is appropriate with the use of standard integration options (e.g SOAP) or scripting/process maps. They are basically POJOs with nifty enterprise configurations around them that allow enterprise class life cycle, versioning and configuration (e.g. in an enterprise BPM system you don’t necessarily want a new version of a component to alter the way an inflight process is operating, or how a completed process reports audit data…) or even have to bounce the server to change the implementation of the DSC. It is definitely part of the secrete sauce of LiveCycle/ADEP Document Services. It’s a sad state of affairs when I feel compelled to write about a good customer service experience but that’s where we are at the moment (and something that I’ve seen improved hugely with tools such as those Adobe is creating at present but more on that in a later post). I had a problem with my HTC Desire HD phone (the SIM card cover was a bit wobbly) so decided to set about ordering a replacement. 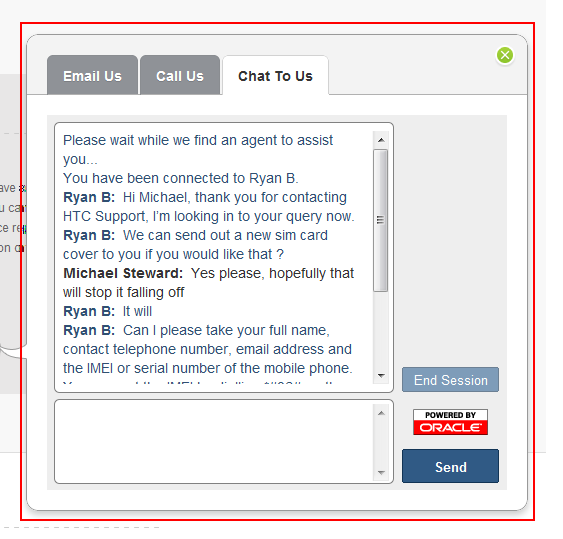 I logged onto the HTC website dreading what I presumed would be a long and painful process of filling out some long form before waiting days if not weeks for a reply. What I actually found was an easy to use support system with a variety of different options to go about submitting my query. Clicking on the “Contact Us” button (note to HTC – this was a little difficult to find as I had to scroll through a long page of images to do with the phone before reaching it) popped out a tabbed window with three options: call (with long office hours), email and chat. I went straight for the chat option and sure enough was instantly through to a human (thankfully not one of those terrible robots that tries to guess the answer to your question with some hopeless FAQ page). The agent was helpful and got everything sorted for a free replacement SIM card cover in no time at all. It’s this sort of experience that keeps customers loyal. I’ve never had an experience as easy as the one I just had with HTC and have already told colleagues and friends about how good they were in resolving my problem and it will certainly make me more likely to buy one of their phones again. ALC-OUT-002-058: Cannot retrieve the resource from Repository Path. A bit of digging around and I hit the a knowledge base article on Adobe’s site. Basically there’s a “limitation” with the way the form is compiled which means relative paths within fragments and XDPs can cause problems. The solution is to turn the relative path references (which are inserted by default in Designer) into absolute paths. Doing this sorted the problem for me but this is something that needs fixing!